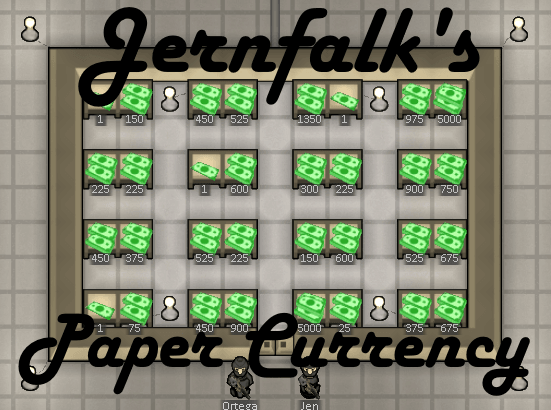 The Paper Currency Mod adds paper currency to the game and to traders. Its base worth is 1 silver, but prices will float according to the pawn’s skills as if he/she were buying/selling. Stacks up to 5000 and weights almost nothing. Outlander traders carry both Silver and paper money since they also trade with tribals. Orbital trade ships carry very little Silver but carry a lot of money. There is now a chance that you’ll get paper money as a reward for missions. It’s silly that everyone has to go around carrying stacks of silver to trade, especially in highly advanced colonies. The Paper Currency Mod gives you a weightless alternative that is just perfect for travelling with big amounts of money, and it stacks better than silver.